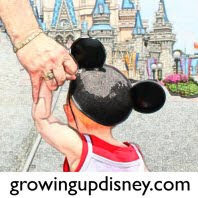 Growing Up Disney: A Walk Around The World With Ridge- Trip Day!!! So today is the big day, about noon I am leaving work and heading for Walt Disney World. If you have been keeping up, this is going to be my first solo trip to the world. If you are new to the site, welcome. Today is my first solo trip to Walt Disney World. In the days leading up to this I have been terribly busy making sure I have crossed all the T’s and dotted all the lower case j’s. So by the time this comes out I will have about 6 hours to go before heading on the nice long 9 or so hour drive to Orlando. If you have read my previous entries you may be saying "I thought Ridge was going on Sunday?" My answer is that I was, but I found out there is an inner mouse meet at Animal Kingdom and the Expedition Everest Anniversary Event is May 5 for AP holders. I, being an AP holder and wanting to meet the gang at inner mouse and Disney Driven Life decided that plans were going to be changed. I will give a big thanks to my job for being understanding and allowing me to alter my schedule this week to letting me get out of town a little bit faster. My bags are packed, touring plans printed and Unofficial Guide is tabbed for easy access *ding*. So have I been busy getting ready to go since I hurriedly made my plans to go down two days early. I checked and a short notice on property stay really wasn't in my budget. After consulting the large online ubiquitous internets of all that is online deals, I settled with trying www.priceline.com for the first time and naming my own price. As it turns out I like this service, I was able to book at the Sheraton Safari hotel off of 535 just one red light down from hotel boulevard. For those familiar with the area, it is right off of property maybe 10 minutes from the Magic Kingdom. I'll stay there for two nights before checking in at Saratoga Springs Resort Sunday. So it begins, this is the year of as many trips as I can muster and being excited to meet all the great members of the Disney community. I will be tweeting and blogging my adventures all the way there and back so I hope I can bring a little humor and a lot of good photos to everyone. If I am going to see/meet you next week I can't wait to make new Disney friends. I will be checking in with you all later today. Sounds like you have a lot planned for your solo trip. I'm looking forward to seeing your pictures and posts. I don't know why, but "dot the j's" made me laugh really hard. hope you have a great trip! can't wait to see update/pics!